A Point of Pride Navy Lieutenant Joe Kenny began his career with the U.S. Navy as a physical therapist and has a demonstrated track record in his commitment to serving others. 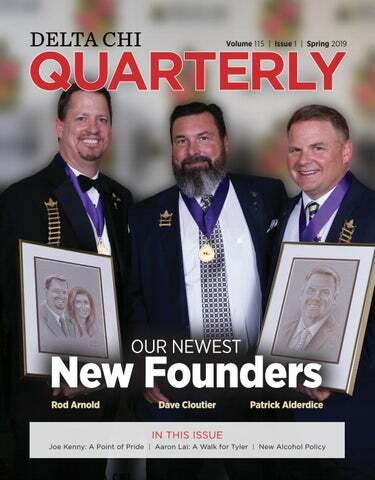 New Founder Profiles David Cloutier and Rod Arnold were honored for reaching the New Founder giving level at the 61st International Convention in Denver, Colorado. Alumni Initiation vs. Alumni Rededication Ceremony A breakdown of the benefits of Alumni Initiations and Rededication Ceremonies, and the role they play in a continued commitment to the Brotherhood of a Lifetime. A Walk for Tyler Aaron Lai completed a 100-mile walk while raising more than $25,000 dollars for cancer research in honor of the late Tyler Trent. ne thing is constant in the fraternity world - change. We see change through elections, policy revisions, and decision-making. Recently, the Board of Regents joined the other members of the NIC by banning hard alcohol. While this is not a huge change for most of our chapters, we must remember it is a change and challenges will occur. When you face change or conflict in your chapter, you have three choices; avoid it, face it poorly, or face it well. Clearly, facing it well is always the best option, but this only comes through preparation. I offer these tips when addressing change. 1. Know what you are doing. It is imperative that you do research and become aware of all aspects of the change or challenge. Focusing on your goals and values of the Fraternity will keep you on track. 2. Invest in the process and people by carefully listening to what others are saying. When conflict is inevitable, pay attention to the stress levels of yourself and others. Individuals turning away from the issue may use silence or aggression to deflect from learning about the issue. 3. Make it safe. As stated earlier, change is often stressful. It is okay to take breaks or step away from conversations only to return with clear heads. Apologize if necessary. Commit to finding mutual understanding. 4. Build your story. Personal reflection and a personal story can help the conversation move forward. Tell others how the situation impacts you. 5. Affirm your path. Share what you know, include your facts, and tell your story. Ask for other’s input and talk tentatively without casting judgement. Lastly, test your path and that path of others. Go forward knowing what is working. 6. Launch into creating change, remembering your ABC’s. A. Agree. Agree with the other person when you agree with what they’re saying. This establishes common ground. After all, you are brothers and you want to get along. B. Build. If facts have been laid down throughout the conversation, take note of this. Build on the common ground you’ve created. C. Compare. Compare your notes and viewpoints. Disagreement doesn’t mean someone is wrong. 7. Lead to an end and decide how to decide. There are several methods you can use to conclude the conversation and guide the decision. Command — One person makes the decision without the consultation of others. This rarely leads to all parties involved feeling satisfied with the outcome. This often occurs with conflicts outside of Delta Chi or with personal issues. Consult — Input is gathered from multiple sources within the group and then a subset decides the outcome. This subset would usually be a judicial board, the “BB”, the Executive Committee, or the ABT. Vote — An agreed upon percentage determines the action taken. Consensus — Everyone comes to an agreement and supports the decision. I hope that these steps will help as you tackle change within your chapter. Although we always encounter change, support is always available through your network of volunteer alumni, campus professionals, and Fraternity staff. These tips were adapted from our friends at Pi Beta Phi and how to have difficult conversations. Facing the change or conflict well, through preparation and conversation, is the best way to move forward. Please Help Delta Chi Save Money! If you would like to receive the Quarterly electronically instead of in paper format, email quarterly@deltachi.org and let us know. This will save Delta Chi both printing and postage costs. here are countless experiences that are shared by members of Delta Chi that begin with connection. Despite the events, flyers, social media campaigns, and all the trappings that come with recruitment, an overwhelming majority of our members can still identify the people who influenced them to join the Brotherhood of a Lifetime. That message rings true for Joe Kenny. “One of the sayings I heard a lot around the USP chapter of Delta Chi was that people don’t just join organizations, people join people,” Kenny said. “I joined Delta Chi because I saw a unique group of people who were unlike the rest on my campus. Although they were small in numbers, they were very impactful.” After joining Delta Chi in 2010, Kenny served his chapter in a variety of roles. Whether working to bring in new members to the Fraternity as the Recruitment Chair, planning and organizing events as the Social Chair, or leading the chapter as the “B”, Kenny worked to support his Brothers and chapter. He was also actively involved on USP’s campus through community service events, philanthropic causes, tutoring, and mentoring fellow students. One of his favorite memories as a Delta Chi was organizing a fundraising event to support his hometown community, which had been ravaged by Hurricane Sandy. intellectually, physically, and mentally. My experiences have enabled me to execute good teamwork with others towards something much larger than myself. Navy Lieutenant Joe Kenny, USP ’15, served in a variety of roles within his chapter. Joe began his career with the United States Navy as a physical therapist and has a demonstrated track record in his commitment to serving others. my knowledge of the human body to the next level.” With his knowledge and experience, there were many potential career options that merited his attention, but only one that stood out. After graduating from USP, Joe Kenny opted to pursue a career with the United States Navy. “I wanted to go above and beyond that of the typical lifestyle and apply my skills to help and work with an elite population.” He was also influenced by his family, as his younger brother is serving in the Marine Corps and was a source of motivation for Kenny. Currently a Lieutenant, there really isn’t a typical day on the job for a Navy Physical Therapist. “There is a lot of OJT, or on the job training, and leadership roles that you learn outside of your job as a healthcare provider. I learn something new every day. A typical day for me up until this point included anything from sitting at a desk and working in an office to transporting in a helicopter, working on a ship, or attending education/ training sessions.” While each day offers something new, that’s part of the appeal for Kenny. Unlike other physical therapy jobs, he appreciates the adventurous nature of his work and the unique opportunities it provides. the next step in his career. Kenny aims to provide physical therapy services in the operational setting, complete the military musculoskeletal residency program, become OCS (orthopedic clinical specialist) board certified, and obtain the Surface Warfare Medical Department Officer qualification. He also is looking to earn the rank of Lieutenant Commander. There is no doubt that Joe Kenny continues to leave a tremendous impact on those around him. “He’s been chivalrous and helpful to his friends, fellow brothers, and I,” Ryan Martin, “E” of the USP Chapter added. “For me, Joe is someone I can trust and can confide in if I needed anything. Joe Kenny is a perfect example of success and strength. Having Joe as an alumnus of the USP chapter is important because he serves as a role model and inspiration for our active members not only as brothers of Delta Chi, but as active members of society. Joe gives us a good reputation that has been mimicked by other alumni and current members.” We are grateful for the inspiration that Joe Kenny provides to fellow Delta Chis, and his service to us all. founders At the 61st International Convention in Denver, Colorado, David Cloutier and Rod Arnold were honored for reaching the New Founder giving level. These men provided unselfishly for the Fraternity with the hopes of creating better opportunities for undergraduate brothers. The Delta Chi staff, Educational Foundation, Board of Regents, and fellow members are all eternally grateful for their contributions and commitment to the brotherhood of a lifetime. rother David Cloutier, Embry-Riddle ’92, is one of three men who was recently recognized by the Fraternity and the Delta Chi Educational Foundation (DCEF) for achieving the New Founder level of giving in 2018. Brother Cloutier’s generous donations assisted the DCEF in pursuing its goal of assisting in the acquisition of a sound education. Reaching New Founder is more than dollars donated - it’s embodiment of each of Delta Chi’s core values. Brother Cloutier understands the dynamic of the Fraternity experience. While it begins in college, it extends well beyond the four years on campus. “You’re an undergraduate brother for four years, but you’re a Delta Chi for the rest of your life,” Cloutier said. “It stands to reason, unless you’re incredibly unlucky, that you’ll be a Delta Chi alumnus for far more years than you were an undergraduate brother. And yet, this organism exists to feed the undergrads, basically.” The President and Chief Executive Officer of Constellation Aviation Solutions in Washington, D.C., Brother Cloutier’s Delta Chi experience began at the Embry-Riddle Chapter under the guiding hand of Brother Gregory Nelli, Alumni Initiate and 2014 inductee into the Order of the White Carnation. “He basically taught us the importance of the reward of a hard day’s labor. It was that experience, the experience of the brotherhood forged in work, a brotherhood forged in fun… We may not have always gotten along, but we were still brothers and it was all for one and one for all.” Those experiences forged more than 25 years ago instilled a concept of service-aboveself into Brother Cloutier – a concept which continues to guide him. “We don’t have a specific service-above-self mantra, but I think when you start to peel back the layers of all things Delta Chi, I think that’s a thread that runs continuously through the blanket, if you will, which is why besides giving my treasure, I’ve given my time.” Brother Cloutier has served multiple roles with the Fraternity, most recently as the ABT Chairman of the Embry-Riddle Chapter. His involvement and assistance to the Fraternity has extended far beyond such roles, however. Whether it be the DCEF, Fraternity, or his home chapter, Brother Cloutier has been there to help however necessary. o Brother Rod Arnold, Texas A&M ’88, achieving New Founder status is both the fulfillment of a promise made years ago and a steadfast commitment to the future of our beloved fraternity. 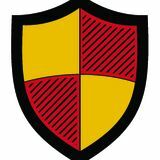 Delta Chi’s New Founders It marks a significant achievement in our lifelong endeavor when a Brother or friend of the Delta Chi Fraternity makes a lifelong commitment to supporting the leaders of tomorrow through the Fraternity and the Foundation. It is with our sincerest gratitude that we acknowledge these driven members of our family. Their enduring commitment to a lifetime of giving allows for a brighter future. Serving on Their Campus IFC Delta Chi is proud to recognize several of our members for their service to their local Inter-Fraternity Council (IFC). These members have gone above the call to action with their chapters to dedicate their time and skills to improving their fraternity and sorority community. Their involvement includes recruitment, philanthropy, finances, and for a select few, the role of Council President. Their leadership has proven worthy to both their campus and the Delta Chi Fraternity. We look forward to their continued dedication to advancing fraternity and sorority life. Dir. of Philanthropy & Comm. Service, Kent State Univ. Dir. of Social Media/Graphic Design, Long Beach St. Univ. Question & Answers 1. Why did Delta Chi make the decision to ban alcohol above 15% ABV from chapter facilities? The primary reason Delta Chi adopted this standard is because it is simply the right thing to do. The Board of Regents adopted this standard for two primary reasons: • Our members and guests are engaging in risky behavior regarding the use of hard alcohol that is jeopardizing lives and safety; and • financial necessity for the Fraternity’s survival. In 2018, we had 12 transports to the hospital as a result of hard alcohol consumption with the highest blood alcohol concentration being .45. In recent years, virtually every lawsuit the Fraternity has been named in involved hard alcohol. We have paid out hundreds of thousands of dollars in damages and each case costs thousands of dollars to defend. As a result, insurance premiums have risen by 80% and our liability coverage has been cut in half. Fraternities in general run the risk of becoming uninsurable if the risky behavior does not stop. 2. How does the Fraternity plan to enforce this rule? The hard alcohol policy is included in the Fraternity’s Risk Management Policy. Alleged violations will be investigated and adjudicated like any other alleged violations. Founded allegations will likely be forwarded to the Risk Management Commission that can impose one of the five levels of corrective action. 3. What will happen if we choose to not enforce this rule in our chapter/colony? If a violation is reported and a chapter is found responsible, it will be subject to one of five levels of corrective action, up to suspension of its charter depending on the severity of the violation. Additionally, violation of the Risk Management Policy may result in waiver of insurance coverage for any resulting damages. This could mean chapter officers and members are personally liable. 4. Does this rule apply to alumni as well? Yes. This policy applies to all chapter facilities and events. Events at chapter facilities attended by alumni as well as alumni chapter events are subject to the Risk Management Policy and thus covered. 5. Did Delta Chi make this decision because of money/ insurance costs? Money and insurance costs make up a considerable amount of the reasons behind the new policy but do not account for the entirety of the decision. The health and safety of our members and guests is of paramount concern. That said, the Fraternity is a business. It cannot operate without insurance. Abuse of hard alcohol is costing hundreds of thousands of dollars. The result is sky-rocketing premiums that our members cannot afford. We as an organization risk becoming uninsurable and unable to continue operations. 6. Was Delta Chi required to do this because of membership in the NIC? Last August, the NIC adopted a resolution requiring all member fraternities to adopt a hard alcohol policy by September 2019. That resolution passed almost unanimously, and Delta Chi supported it. The Board of Regents adopted this policy because it simply is the right thing do and is in the best interests of our members and the Fraternity. ach of us has a unique story and our own journey that led us to Delta Chi. For some, they first learned about Delta Chi as an undergraduate on campus. Others heard stories of family members’ own experiences as a Brother in the Fraternity and seek Delta Chi as a legacy. Whether you’re looking to offer an Alumni Initiation, Alumni Rededication Ceremony, or preparing for any Delta Chi ceremony, our Ritual Committee is a great source of insight. Help ensure your ceremony or Ritual runs smoothly and is impactful for everyone involved! For questions or more information about how to get involved with the Ritual Committee, contact Mark Sluss at slussm@charter.net. Open to any adult male who has not been initiated by another general or social fraternity. For undergraduate members within six months of graduation, or has graduated/ left their institution with no intention to return. Alumni initiations are not an honorary title. It provides full membership in the Delta Chi Fraternity, with all the rights and responsibilities of a member. This ceremony is another step towards full understanding of the values of Delta Chi and your new role as a supporter and mentor for future generations of Delta Chi Brothers. Promoting alumni initiations is a great opportunity to build support for your organization, increase buy-in from parents and stakeholders, and expand your pool of potential volunteers. The Alumni Rededication Ceremony provides your undergraduate members a challenge to commit to immediately living their lifelong Bond. It also provides a unique opportunity for alumni to reconnect with your organization, and can lead to stronger alumni relations. Potential candidates for Alumni Initiations could include fathers/ step-fathers, uncles, grandfathers, faculty/staff members, local business leaders, public servants, and leaders of nonprofits. The impact of both Trent’s story and his grandfather’s battle motivated Lai to do something much bigger than himself. Despite seeming like a completely improbable and at times foolish commitment, Lai came up with an idea that had an impact far beyond his initial vision. On January 18, 2019, Lai launched a GoFundMe page announcing his decision to embark on a 100-mile walk beginning on February 17 that would take him from his campus in West Lafayette, Indiana down to Bloomington, the site of the Big Ten college basketball matchup between the Purdue Boilermakers and the Indiana Hoosiers. The walk would take three days to complete, with an average of 33 miles per day. The purpose of the walk was to spread awareness and raise money for the Tyler Trent Cancer Research Endowment, which funded cancer research at the Purdue University Center of Cancer Research. “It’s going to be a really long journey,” Lai said prior to departing. “My feet are going to hurt but, in the end, it’s to benefit someone else. Purdue Pride is a big part of it because we always try to help each other out.” A Google Maps search of the route revealed that one would have to walk for 11 hours per day to complete the trip in three days. Knowing this, Lai began training by walking four hours per day around his campus and community. He made arrangements with his chapter brothers to have them periodically meet him on his journey to deliver food, water, and dry shoes. He used social media to spread information about his GoFundMe page and the purpose of his journey. He garnered local media attention and spoke to reporters about his trip. He set a goal of raising $10,000 to go towards Trent’s Endowment. And with each plan, each level of preparation, and every gain, he pushed closer to his departure date. After a month of anticipation, the day finally came. Loading up on oatmeal and the well wishes of his chapter brothers, Lai departed before sunrise on a Sunday, slated for 33 miles of walking through the bitter Midwest winter. When he began in the morning, he had raised $6,100 towards his goal. Over the next 12 hours, news reports spread his story. Communities across central Indiana began to learn about Lai and his walk for Trent. Lai’s social media posts began trending, and by the end of his first day of walking, his fundraising total had already crossed the $10,000 mark. Lai took to social media to spread the news of his accomplishment and of his safe arrival at the first stop. Having already met his goal only one-third of the way through his journey, it would’ve been easy for complacency to set it in. But Lai is resilient and pressed on into his second day. Reaching the midway point in his walk, the physical realities of his highly unlikely journey began to set in. Important Milestones Alabama Brian Hamilton ’09, was named the Editor of the Pickens County Herald. Kansas State Born to Brother and Mrs. Andy Hanson ’99, a daughter, Amelie on June 5, 2018. Ohio State Born to Brother and Mrs. Robert Kovey ’04, a daughter, June Rose on November 29, 2018. Cal Poly Born to Brother and Mrs. Steven Urrutia ’94, a son, Dante Vahan on February 8, 2019. Born to Brother and Mrs. Matthew Gorney ’06, a son, Theodore Allen Gorney, on March 5, 2019. Born to Brother and Mrs. Steve Brandjord ’06, a son, Jonas on October 19, 2018. South Dakota Born to Brother and Mrs. Ben Wise ’11, a daughter, Elizabeth Laurence on November 20, 2018. LSU Brother Christopher Gray ’93 married to Amanda Miller on December 29, 2018. West Carolina Brother Benjamin Lee Sheehan ’08, married to Ali Cundari on October 19, 2018. Born to Brother and Mrs. Nicholas Marinello ’10, a son, Joseph Paul Marinello on November 18, 2018. Brother David Byron Keener III ’06, married to Cady Nell West on November 10, 2018. Duquesne Born to Brother Stephen Hudak ’11, a son, Richard Eugene Hudak, on August 25, 2018. Hayward Born to Brother Edwin Alarid and Zoraida Quiroz ’14, a son, Cuauhtemoc on October 12, 2018. Illinois State Brother Nicholas Hevesy ’14, married to Michelle Zabkiewicz on October 13, 2018. New Haven Born to Brother and Mrs. Brendan O’donovan ’08, a daughter. West Georgia Born to Brother and Mrs. Paul Whatley ’04, a daughter, Annaleigh Rose Whatley on November 9, 2018. The University of Nebraska, Omaha (UNO) Colony of The Delta Chi Fraternity was colonized February 2019 and is off to a fantastic start. The recruitment team, consisting of Leadership Consultant Manuel Macias and Fraternity Growth Coordinator Divante Hamilton, worked tirelessly to recruit a quality Founding Father class totaling 35 men. The men are very excited to get the ball rolling in their Delta Chi experience and are looking forward to future social, philanthropic, and community events with several other Greek Organizations at UNO. The colony shows a desire for leadership roles and opportunities to positively impact the UNO and greater Omaha community. As the spring semester progresses, the men have been participating in Delta Chi’s new Associate Member Program. They are looking forward to furthering their brotherhood, learning about themselves, and discovering the type of leader they want to be in this colony. The members of the UNO colony are excited for their journey in becoming initiated members of the Fraternity and are looking forward to celebrating their milestone on April 20, 2019 when they will be initiated. We are excited to see the excellent things they will accomplish in the future. The Denver Colony of The Delta Chi Fraternity was colonized in January 2019 and they are nearing the end of their first quarter within the Delta Chi brotherhood. The recruitment team, consisting of Leadership Consultants Manuel Macias, Michael Buford, and Kenny White, recruited an outstanding and high-quality Founding Father class totaling 47 men. The men are excited for the opportunity to develop their Delta Chi experience and have been actively engaged in the larger Fraternity and University of Denver Community. Our men have already been very active on campus and they have spent time supporting Beta Theta Pi’s Annual “Date-ABeta” philanthropy event, attending the Fraternity and Sorority Life “1860 Formal,” and attending the Region IV RLC. They have established amazing relationships with the campus community and have focused on planning philanthropy, community service, and social events for the spring quarter. This past winter, the Colony went through Delta Chi’s brand-new Associate Member program, held various brotherhood events to get to know each other, and had conversations with many of Delta Chi’s IHQ directors and coordinators, including in-person visits from Executive Director and CEO Jerod Breit and Director of Fraternity Growth, Heather Lockwood. On March 16, 2019, the Northern Colorado Chapter and Colorado State Colony will be traveling to Denver to initiate the Denver Founding Fathers. The men are extremely excited to be men of action who do fraternity right and make a positive impact in Delta Chi and University of Denver community.